This rug is absolutely beautiful it’s a nice weight and comfy on the feet, stunning for a French or Paris theme ! Beautiful shades of gray cream and black ! Solid loop! Safavieh Indoor/ Outdoor Courtyard Beige/ Brown Rug - 8' X 11'-2"
Grey Polypropylene Paris Eiffel Tower Modern Area Rug - 5'3" x 7'3"
Safavieh Indoor/ Outdoor Courtyard Black/ Beige Rug - 5'-3" X 7'-7"
Celebrate the splendor of the City of Light with this Eiffel Tower-themed area rug. 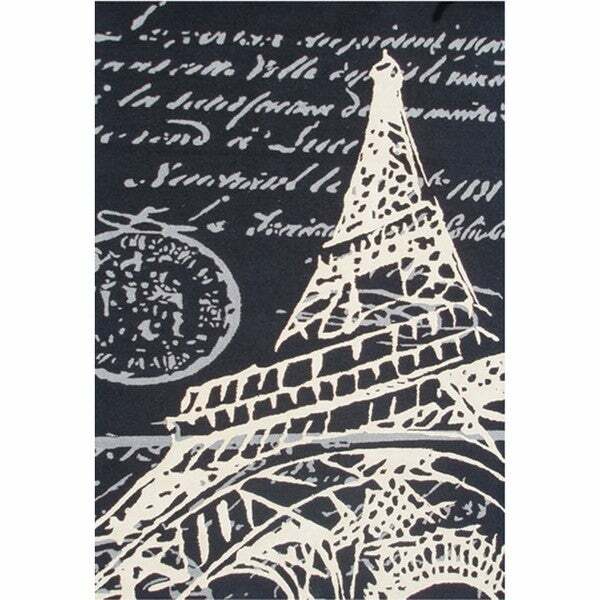 This hip, hand-hooked rug's text and image design combo is ideal for lovers of chic Parisian style. My daughter loves this rug for her Paris room. After a couple of months the rug still looks great and is very nice quality. We are happy with our purchase. Safavieh Indoor/ Outdoor Courtyard Beige/ Brown Rug - 5'-3" X 7'-7"
Safavieh Indoor/ Outdoor Courtyard Black/ Beige Rug - 8' X 11'-2"
KC CUBS Paris Eiffel Tower Boy and Girl Bedroom Modern Decor Area Rug For Kids and Children - 3'11" x 5'3"